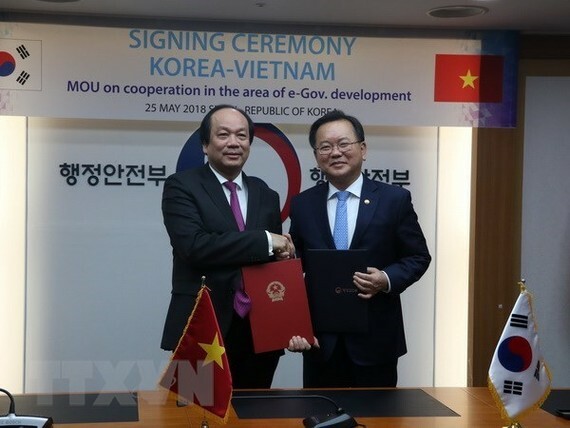 Vietnam and the Republic of Korea (RoK) will join hands to develop e-government system in Vietnam under a Memorandum of Understanding (MoU) inked on May 25 between Minister-Chairman of the Government Office Mai Tien Dung and RoK Minister of Interior and Safety Kim Boo-kyum. Vietnam wants to learn the RoK’s strategies and solutions to building e-government, Dung said, noting that both sides need to set up a channel to exchange information and establish a joint working group for long-term and effective cooperation. 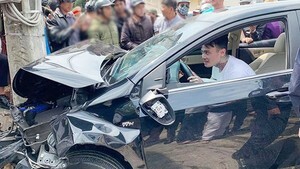 “I hope that the two countries will actively implement the MoU and the Minister of Interior and Safety will back the Vietnamese Government Office to carry out the agreement”, Dung said. Kim Boo-kyum, for his part, expressed his belief that as Vietnam holds a significant part in the “New Southern Policy” of RoK President Moon Jae-in, the bilateral relations will be deepened in various fields, including diplomacy, economy and culture. Regarding the building of e-government system, the RoK Government sees Vietnam as its important partner and a group of Korean experts was sent to Vietnam in December 2017 and March 2018 to discuss the e-government building cooperation project, he stressed. The RoK has been successful in building e-government system. The country ranked third in the UN’s e-government survey in 2016 thanks to its legal corridors for information technology application in e-government development. The same day, Dung had a working session with the RoK Minister of Science and ICT. On May 23, he met with RoK Government Policy Coordination Minister Hong Nam-ki, who hoped that the Vietnamese Government will create favourable conditions for the Korean investors in the country and support RoK financial and cosmetics firms who want to break into Vietnamese market in handling procedures. On the occasion, Dung invited Hong to pay an official visit to Vietnam in a proper time and the later accepted the invitation with pleasure. During his stay in the RoK from May 22-27, the Vietnamese official received representatives from large corporations, visited Samsung SDS and the national database centre in Daejeon city, and surveyed smart city model in Incheon city.